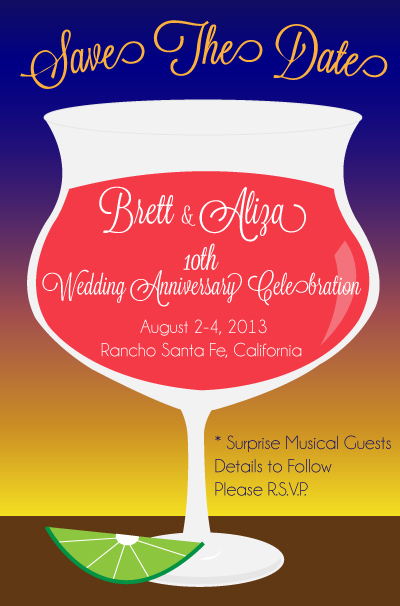 Brett and Aliza's 10th Wedding Anniversary took place at their new summer home in Rancho Santa Fe in sunny Southern California. The celebration weekend consisted of a citrus theme based off of the lemon and lime groves located on the property, guest musical performers, and a brunch on the beach. The Save The Date invitation captures the festive feel of the event through illustration as well as the elegance of a wedding anniversary through typography. Brett and Aliza's 10th Wedding Anniversary took place at their new summer home in Rancho Santa Fe in sunny Southern California. The celebration weekend consisted of a citrus theme based off of the lemon and lime groves located on the property, guest musical performers, and a brunch on the beach. The Save The Date invitation captures the festive feel of the event through illustration as well as the elegance of a wedding anniversary through typography.